Before you got married, you probably discussed where you wanted to live, whether or not you would have kids and your general hopes for the future. Before you bought a house, you and your spouse talked about where would be best, what size home you hoped to acquire and more. Before you had kids, you hopefully discussed discipline philosophies, educational goals and roles and responsibilities for raising them. Only a small percentage of respondents expressed confidence in their partner’s abilities to manage their finances. Less than half of couples make routine financial decisions, such as budgeting and paying bills, together. Only 38 percent jointly discuss their investment and savings strategies for retirement. 1. What Do You Want to Do in Retirement? It is amazing how many people don’t discuss or even think about their long term goals and aspirations, let alone what their spouse might want to do. It is perfectly fine for one spouse to follow the other’s lead. You can certainly think of spouses who picked up golf because their partner plays. Or, found a way to love camping because their husband or wife loved the great outdoors. Get inspired by amazing accomplishments by older retirees. And, more amazing accomplishments by older retirees. Retirement travel: tips for funding your wanderlust. Do you need a retirement coach? 120 Ideas for what to do in retirement. 2. When Are You Going to Retire? It is not unusual for one spouse to want to retire long before another. In fact, less than 20% of all couples stop working in the same year. However, you both need to be on board with the financial strains that retirement may cause. Nevermind the marital stress. “Research shows that marital stress increases during the initial two years of retirement, especially when the husband retires first. Jobs, like kids, can be buffers in a relationship. Once the structure of work is gone, unresolved issues rise to the surface,” said Stephanie Coontz, a social historian, to AARP. These difficulties can be eased if you’ve discussed your retirement date and are in agreement with your overall plans. And, if you are disagreement, use a retirement calculator to try different scenarios. The NewRetirement retirement planning calculator makes it easy for you to see exactly what happens to your overall finances with any one change. 3. Where Do You Want to Live? Have you ever dreamed of living in a shack on the beach? Closer to grandchildren? In an apartment in the big city? Anywhere else than where you are now? Does your partner know about these dreams? Retirement is a really unique opportunity to uproot your life and live the way you have always wanted. And, because housing is typically the biggest expense for most families, relocating can have a huge impact on your overall finances. Try out different housing ideas — downsizing, upsizing, getting a reverse mortgage and more — in the NewRetirement calculator. 4. What Roles and Responsibilities Do You Want if a Long Term Care Event Happens? No one wants to think about — let alone discuss — the possibility of a long term care event. However, the reality is that one of you is likely to experience an event like stroke, diabetes and plain old age that will require you to need help with your care. Forty two percent of people over the age of 65 require, or will require, long term care and neither Medicare nor Medicare supplemental insurance cover the costs of these services – neither in your own home nor in a nursing facility. Without a clear plan in place, the burden of your care will fall on your spouse. Though many individuals consider it an honor to tend to their loved one, you might want to clarify each of your thoughts on this subject and budget appropriately — can you afford assisted living? in home assistance? Furthermore, what happens to the remaining spouse after one of you has passed. What is the plan for the surviving partner? You can explore 5 creative ways to plan for and fund long term care. And, money issues become even more critical when you retire and are living off of a fixed set of resources for 20-30 years. After you have discussed what each of you want out of this time of your life, you will really need to dig into the details to see if your finances make what each of you want at all possible. You’ll want to look at every financial detail when you retire. When you each start Social Security. What kinds of savings each of you have. Do you have life insurance? What kind of health insurance? How much debt? A retirement calculator can actually be a great way to facilitate a meaningful discussion about your finances in an organized and unemotional way. This kind of session is ideal for getting the two of you on the same page. The good calculators, like the retirement planning calculator, will ask you important questions and guide you through the process. Schedule a couple of hours with your spouse and go through the calculator as a couple. Just be prepared to communicate clearly and compromise fairly. 6. How Much Risk Are You Willing to Take? What Are Your Financial Values? As part of your overall retirement financial planning, you will need to agree on some ground rules and values that will govern your retirement finances. “Even in the best relationships, money can stir up intense feelings that complicate the retirement decision,” says Dorian Mintzer, coauthor of The Couple’s Retirement Puzzle. Investment Risk: Some people are willing to take more risk with their money than others. As a couple, you’ll need to agree about how much — if anything — you are willing to potentially lose. Do you want to guarantee adequate retirement income through something like annuities? Or are you willing to hope that nothing happens to the financial markets that would cause you to live below your desired lifestyle? Debt: There are lots of people who simply would never quit working while they still have debt. What do you do if your spouse is one of those people and you are not? Unexpected Expenses: How will you, as a couple, handle unexpected expenses like an aging parent or child who needs money? A natural disaster? A car accident? Financial Intelligence: It is likely that one of you knows more about personal finance than the other. However, this can only complicate planning since it may sometimes feel like you are each speaking a different language. Budgets: When you were working, your monthly spending could flow more freely than it can in retirement. Depending on your finances, you may need to adhere to a strict budget. Some people are naturally good at this, others take a more freestyle approach to spending. If you and your partner are not of the same budgeting style, it can get tricky and stressful. To resolve some of these nitty gritty and complicated issues, again, you may want to walk through a retirement calculator together where you can see the immediate and long term impact of each viewpoint. You may also benefit from meeting with a financial advisor to help you navigate these matters and forge a compromise that both makes sense and feels right to each of you. The economy is always in flux. Hardly a day goes by without a disturbing headline about the stock market, inflation, taxes, healthcare costs, the collapse of Social Security and more. Never mind that your own personal situation will evolve. 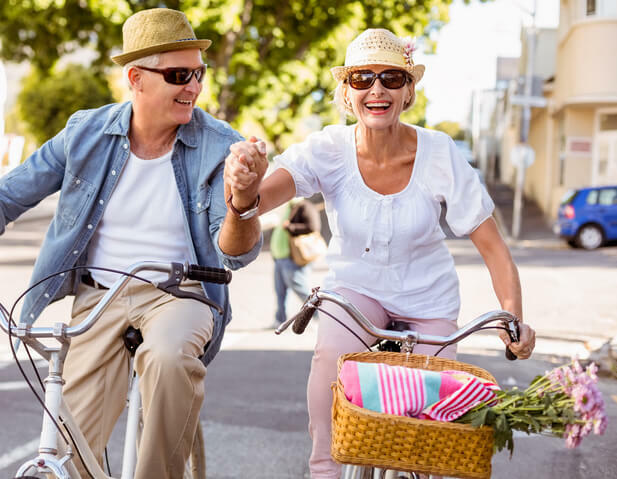 It is therefore important for couples to sit down periodically — quarterly at least — to discuss and update your overall retirement and estate plans. The NewRetirement Retirement Calculator is one of the only tools that saves your information for you so you can easily log in and look over the results together and then play with ways you can improve your plan. 8. Do You Have an Estate Plan? A retirement plan is not all that you need. You also need to forge a mutually agreed upon estate plan. If you are wealthy enough, you need to agree about what you will leave behind and to whom? It is not uncommon for one partner to have made promises that the other is not aware of. Retirement is a good time to get on the same page. Do each of you have and understand each others’ Advance Directives? Advance directives are documents — usually a living will and a medical power of attorney — that define how you want to be cared for if you become incapacitated. Will you be each others’ financial power of attorney? Or, will you assign one outside person to serve for each of you? Location of official papers like Social Security cards, marriage certificates, etc..
Make sure all of your beneficiary designations are up to date. A financial advisor can be a tremendous resource for setting up a thorough and reliable estate plan. Ready to tackle your retirement plan (with your spouse)? Empty Nest? Why It’s Still Not So Easy to Fill Up Your Retirement Nest Egg!